Tomorrow is Memorial Day. Earlier this week, I found out that a good writing buddy lost his battle to cancer a few months ago. He was a veteran, and an amazing writer, and so I talked a lot about him. From afar drawing nigh — Falls the night. 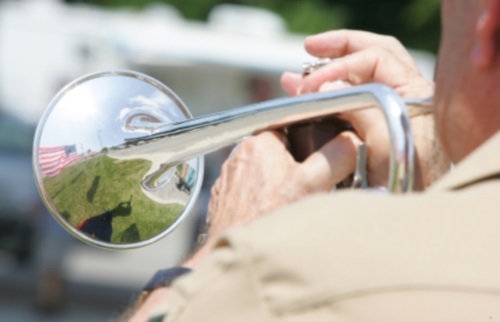 Like many people, however, especially those of us with family, friends, or loved ones serving in the military, “Taps” has a more emotional context. It’s the bugle call you hear at funerals, and once you’ve heard it in that setting you never lost that connection. For me, the tears come, mostly for my grandfather, but for a string of others as well, from the very first note. This weekend, Memorial Day Weekend, “Taps” is playing on an infinite loop in my head. Why? Because I found out recently that a dear friend, a military veteran who survived a tour in Afghanistan with the U.S. Army, then a year in Kabul with the National Guard, lost his last battle, one with that insidious enemy we call “cancer,” in February. His name was Mike Greene, but I knew him best by the handle he used on OpenDiary (an early blogging platform that existed before LiveJournal or Blogger): WarriorPoet. You can read the entire post here: http://allthingsgirl.com/2013/05/sunday-brunch-heroes-villains-and-loss/. My friend Debra invited me to Medium last month, but it took me til late last night to write anything there, and then, I waited til this morning to take it live. The pattern of this visit was similar to most others: I bantered with my barista, who commented on the color of my hair that week, asked how my writing was going, mentioned she’d bought tickets to my improv troupe’s show the next week. I spent a few minutes people-watching (a father and his teen daughter were both absorbed with their cell phones, two teens were on a very awkward first date, a table of young women was engaged in animated conversation), and then, drink in hand, I made my way to the door. I was watching Julie & Julia again yesterday because I didn’t feel well and wanted something comforting to watch, and Meryl Streep does such a great job of playing Julie Powell’s version of Julia Child that the film is worth re-watching. Also, I’ve been reading a memoir about a woman’s adventures with the different sweet shops in Paris (and New York) and since I couldn’t convince Fuzzy to go buy me a chocolate croissant, watching people enthuse about amazing food was almost as good. Shirley Bassey does not sing it in the movie. But she did sing it. And just as there’s no such thing as too much butter, there’s also no such thing as too much Bassey. Thursday is nearly over, but I wanted to write about bread, so I’m doing it this way. 1) I spent the day baking bread. Well, that’s not true. Twice today, I spent several minutes tossing the ingredients for bread into the bread machine and pressing buttons. But I spent the day smelling fresh bread being made, so it sort of counts, right? 2) My bread machine is a Breadman Plus, and was a joint gift from my mother-in-law and sister-in-law years ago. It remains one of the best gifts I’ve ever received. It has a jam setting that I’ve never used, though I have been tempted. I don’t really like jam though. 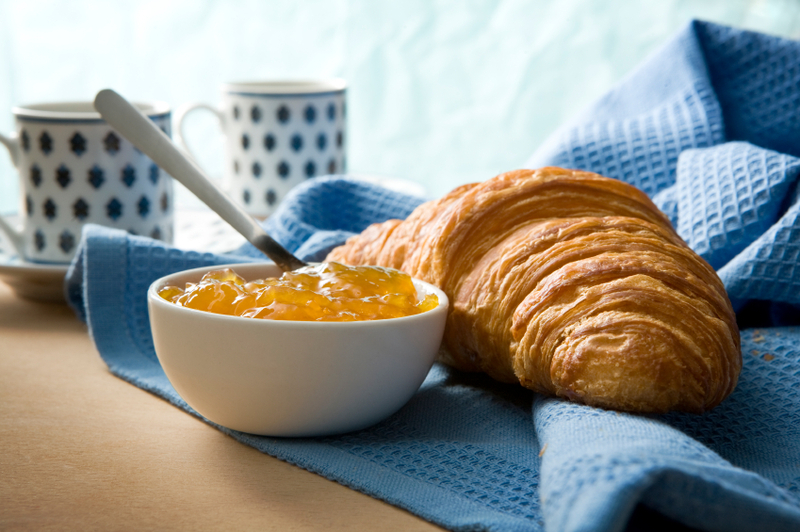 I like marmalade. And lemon curd. 3) I learned my love of bread-making from my grandfather. He had a bread machine, too, of sorts. It was a large copper bowl with a hand crank, and it was meant to make it easier to mix the dough. 4) My fondest memories of my grandfather are of the times when we baked bread together. He would wear a blue calico apron with “Chief” embroidered across it (made by my mother – my grandmother’s matching one said “Chiefie”), and I remember him putting cornmeal in the bottom of loaf pans, and knocking on baked loaves to see if they sounded “done.” I was always amazed by the way his rough, thick-fingered, calloused hands could be so gentle with dough. But they were gentle in the garden, as well. 5) My grandfather was a great fan of James Beard. I’m not his greatest fan, but I love the way he wrote about bread. He said, “Good bread is the most fundamentally satisfying of all foods; and good bread with fresh butter, the greatest of feasts.” I agree completely. 6) Just as I have a thing for beach novels, and coffee houses, I have a thing for bakery books. One of my favorites is Bread Alone, by Judith Ryan Hendricks. It’s a lovely story about a woman whose husband leaves her, prompting her to rediscover her love of baking, which began during an apprenticeship in France. Okay, I know, it doesn’t sound lovely, but trust me, it is. There’s a sequel, but it’s not as good. 7) Last year, when I visited my mother in La Paz (Baja Sur, not Bolivia) we found a Greek restaurant where the owner/chef bakes his own bread. He got me hooked on this rustic whole-grain loaf filled with pesto. It was amazing. 8) Sprouts sells a walnut raisin cinnamon bread that is to die for. It’s even better when toasted and slathered with honey-roasted almond butter. 9) My grandfather used to keep a special crock on the back of the dishwasher. It was his sourdough starter. I’ve never been fortunate enough to have anyone give me sourdough starter, but I have successfully done a wild-capture, when I still lived in California. 10) San Francisco style sourdough is special because of the type of yeast (wild captured), and the refreshment ratio (40%), but you can actually make it pretty much anywhere. However, true San Francisco sourdough is also special because you’re eating it in slightly salty, coastal air. 11) When Fuzzy is away and I really don’t want to cook, I often make a meal out of good bread, cheese, olives, and fruit. 12) In my family, Italian bread is the soft baguette that you eat with pasta, and it isn’t covered in garlic and cheese. We fight over the ends. 13) White bread (except baguette) never crossed the threshold of my house until I married Fuzzy. I looked at it in horror. He never bought it again. My favorite sandwich bread is pumpernickel. Especially if there’s liverwurst involved.